bl.uk > Online Gallery Home	> Online exhibitions	> Asia, Pacific and Africa Collections	> Bombay Green of 1862. 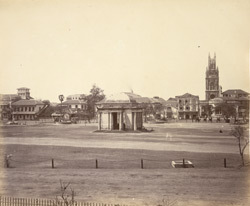 Photograph of The Green in Bombay (Mumbai), Maharashtra, by an unknown photographer, from an album of 40 prints taken in the 1860s. Bombay Green was the spacious open sward near the Bombay Fort and with the Town Hall and other important buildings sited in its vicinity, it was the city's commercial and social centre in the early 19th century. The view looks across the Green, with the Cornwallis Monument in the centre and the tower of St Thomas' Cathedral in the right background. The busy port and industrial hub of Bombay is the capital of Maharashtra. During British rule, it was the administrative capital of the Bombay Presidency. Extending over a peninsula into the Arabian Sea on the west coast of India, Bombay prospered with maritime trade and became the chief commercial centre of the Arabian Sea. Originally a collection of fishing villages of the Koli community built on seven islands, Bombay was by the 14th century controlled by the Gujarat Sultanate who ceded it to the Portuguese in the 16th century. In 1661 it was part of the dowry brought to Charles II of England when he married the Portuguese princess Catherine of Braganza. By the 19th century, the British were in control of India and they embarked on a programme of building commensurate with their power and primacy. Bombay burgeoned over the decades and boasted a skyscape of colonial architecture. In executing their architecture, the British looked to Europe and classical and Gothic revival forms.